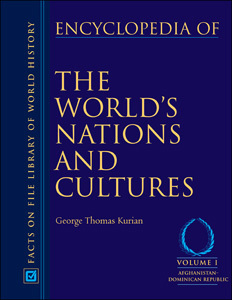 Encyclopedia of the World’s Nations and Cultures provides concise and objective descriptions of the dominant political, economic, social, and cultural systems of the countries of the world. The encyclopedia features country-by-country surveys in 40 separate categories, as well as maps, tables, charts, and lists that are linked with narrative accounts of each nation's peoples, history, government, society, and culture. "...easy to read...an excellent resource, which definitely has a place in school and public library collections. Recommended." "Any library wishing to provide on-demand access to this type of information, especially for students, is well advised to consider [this encyclopedia]."